Call it the luck of the Irish...economy. Ireland is booming. It grew almost 7% last year. That's far better than the U.S. and on par with China (or, at least, what the Chinese government claims). The emerald isle won the "best eurozone economy" prize each of the past two years and is widely expected to keep the streak going this year. Ireland's economic success wasn't a given. The country was hit very hard by the financial crisis and Great Recession. Big Irish banks were on the verge of collapse from too much lending, especially on speculative property deals. Government debt skyrocketed, and unemployment topped 15% -- significantly higher than what the U.S. experienced. Only a few years ago, experts warned that Ireland, Spain and Portugal could be the "next Greece." Ireland received €67 billion ($73 billion) in international bailout loans in 2013, after its property market collapsed and banks started failing. 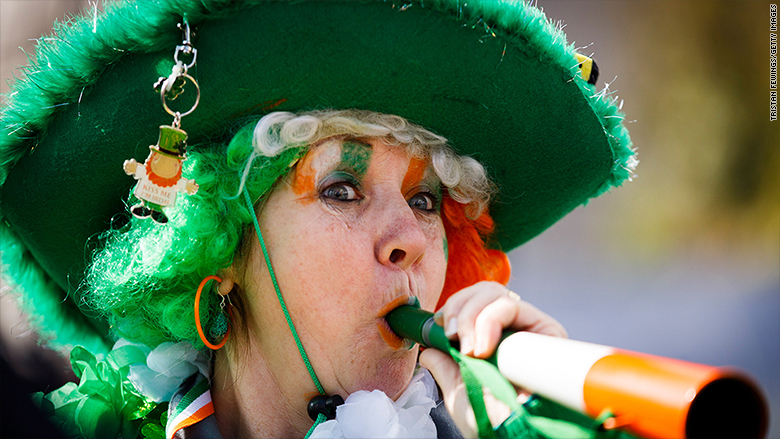 Now the Irish have extra reason for St. Patrick's Day cheer. Unemployment recently fell to 8.6% and no one is talking about an Irish default anymore. "Ireland bounced back the best of any economy after the recession," says Martin Schulz, head of international equity at PNC Capital Advisors. The path to success sounds simple: Ireland quickly wrote off its bad bank debt and made sweeping financial reforms, says Schulz. The government cut costs and focused on growing exports. That turned out to be a shrewd move as the euro has fallen in value, allowing Irish (and other European) exports to thrive. The reform measures weren't always popular. 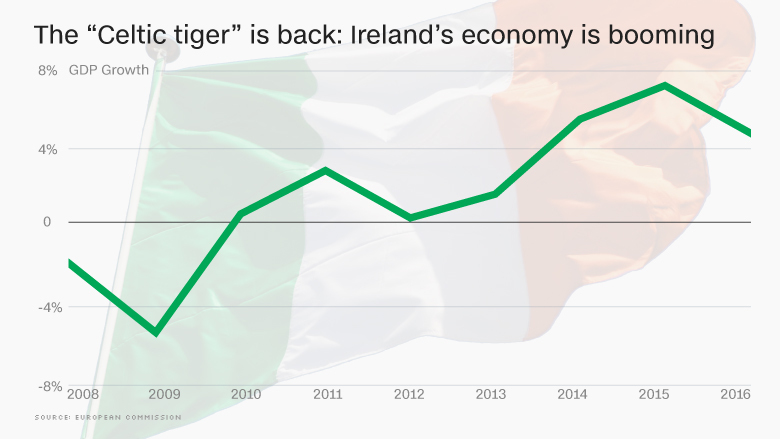 Despite Ireland's "Celtic tiger" growth miracle, Prime Minister Enda Kenny is struggling to hold onto power after his party lost seats in the latest election. But as many countries, especially in Europe, struggle to jumpstart growth again, Ireland is a symbol of hope. President Obama hailed "significant progress in the rebound of the Irish economy" when he met with acting Prime Minister Kenny on Tuesday. Ireland is widely known as a tax haven. Several prominent U.S. corporations have headquarters there (or are trying to move there) to save money on taxes. But the European Commission points out that the real Irish economy is growing too. It's not just foreign businesses. "While the recovery started in the external sector, domestic demand is now driving GDP growth," a recent EU report concluded. --CNNMoney's Ivana Kottasova contributed to this report.